The Title of this beautifully presented publication will ensure a second glance from even the most unobservant browser. Michael Sheils has managed to cram a whole host of memories into this 77- page book in a way that leaves the reader hungry for more. Even before this little gem of local history appeared, I had been familiar with the author's work, having heard his stories at many readings throughout Meath. Given the enthusiastic response these had invariably received, it was only a matter of time before he brought them together in book form. This is a publication that will live long in the memory and whenever the subject of Navan of old comes up there will always be a place in the conversation for the writings of Michael Sheils. The fascinating illustrations add a great deal but is in the honest telling of the stories that the author excels, including many recollections of his childhood. Published by the author himself and selling at just nine euro, this is a wonderful addition to the history of the town. It will bring back many memories for older residents, as well as providing younger readers with an insight into Navan's past.
" 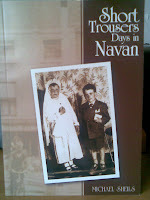 Short Trousers Days in Navan " which was very interesting, amusing and in some cases a little bit shocking. Some of the stories of your school days explain to me why the campaign for the ending of corporal punishment started in Navan!! A Navan man who completed his Leaving Certificate English exam only last year has written a book looking back on his memories of growing up in the town. Michael Sheils from Woodlands took part in the Meath Vocational Education Committee Adult Literacy Scheme, Having left school as a youngster in 1962, when he was just aged 13, before he completed the Primary Certificate. In 1998, at the age of 49 he returned to the Adult Literacy Scheme and completed his Junior Certificate two years ago. He has now produced a delightful volume " Short Trousera Days in Navan ", looking back on growing up in Navan in the 1950s and his subsequent days in the FCA, Tara Mines, and for a while, the British Army.
" The seed for the book was sown back in 2000, when Alan O'Hanlon of the Meath VEC suggested the idea of compiling a lit of the students' writings for the millennium," Michael says.
" I wrote a piece entitled " Short Trousers " and was delighted when it was included in the book, " he continued. " However, it was a limited edition publication which wasn't for sale, and a lot of people were asking where they could get it. " Such was the positive reaction to Michael's recollections and musings about the Navan of his childhood, that he eventually decided to turn his hand to writing his own book, and produced the 14 - chapter " Short Trousers Days in Navan ". Michael's nickname was " Sheriff ", given to him by milkman Harry Finnegan, who thought he walked like Gary Cooper in " High Noon ". He grew up in Connolly Avenue and later St Brigids Villas. There's a cast of characters in the book - Anchor, Scut, Pa and Fitzer, Threads, the Dying Rebel and Beardy and the antics and roguery that the lads got up to in 1950s Navan. Like bottle races or having fun at the expense of the courting couples coming from the Beechmount, are recounted. Even a few close shaves the lads had in their own courting days! Memories of the cinema, circus and the Corpus Christi processions are featured, as well as tales of the FCA and Sergeant Jack McGlew. Later, Michael spent a period in the British Army when he emigrated to England for work, but left it when things began getting violent in Northern Ireland. He recounts the tough army life, and also deals sensitively with family affairs such as his father's battle with Alzheimer's, his sister's death and his own accident at Tara Mines. The reasons why he left school as a young lad are also recounted - the cruel and violent treatment meted out by the De La Salle Brothers, " the Men in Black " at Schoil Mhuire on Abbey Road. He remembers the treatment he and other young lads suffered at the hands of various Brothers there, and how he thought he'd never get out of it.
" After the humiliation the Brother had put me through, I simply switched off, " he writes. He remembers the time in 1969 when the News of the World carried a story on the abuse, and was cleared out of all the shops in Navan when townsfolk were at 8am Mass, so that they wouldn't be able to read it. The following week's edition, with a follow-up, was stopped at Kilcarn Bridge. Still enjoying it Michael. How about some audio excerts. Member of Meath Writers Circle since 2000. Also a member of the Small Impact Writers' Group based in Navan.